Let Me In has given me a rare case of the "I don't knows". it is a remake, and I feel that it is a needless one at that (although what remake isn't?). Sure things have been changed, some possibly for the better, but the film doesn't present many things that weren't already perfect in the original. This unfortunately adds a superfluous feel to the film. If the original is so good, why remake it? I have been outspoken about remakes for as long as I can recall, I love Asian horror films and it always pains me to see them dulled or watered down by Hollywood in an attempt to cash in on the popularity of such horror simply for a market who can't be bothered to read subtitles. Having said that I have enjoyed a number of remakes as well, The American remake of The Ring would be one of the few films that I think in some ways surpasses the original film on which it is based (Ringu), but it can do that because the original, despite being an awesome film, is not technically perfect. For me, Let the Right One In was perfect. Which leaves me with the predicament I am in now. 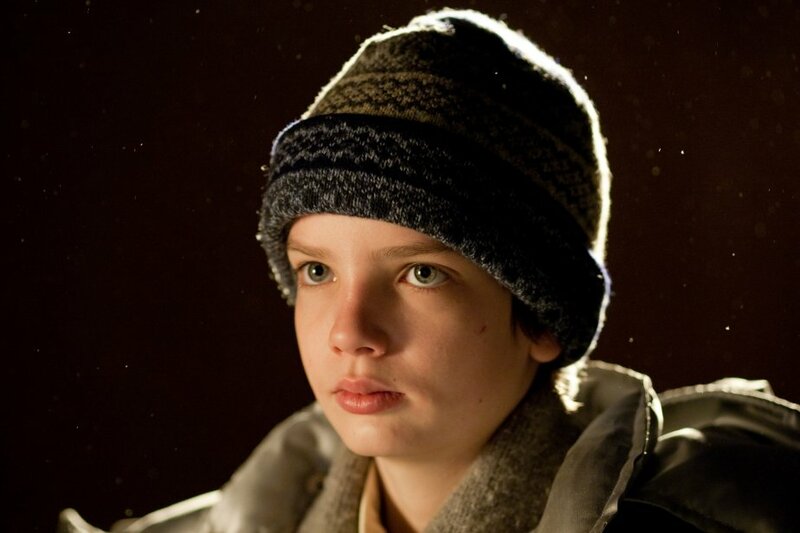 Owen (A perfectly cast Kodi Smit-McPhee) is a young boy living in a cold and cruel world. He is consistently bullied at school, has no friends to speak of and his parents are in the process of getting a divorce. He lives with his mother on a bleak estate in New Mexico a place where no-one would move to on purpose. So it is of some interest to him when a young girl and her father have moved in next door. Of course Abbey (Chloe Moretz) and her "Father" (Richard Jenkins) are not what they seem to be. Soon after their arrival the quiet little town is rocked by a number murders, seemingly related to satanic rituals and the local police detective (Elias Koteas) has his work cut out for him. Owen meets his strange new neighbor one night on the jungle gym in the middle of the building complex. Whilst he senses that something is not quite right (for a start it is snowing and she isn't wearing any shoes and shows no sign of being cold), he still feels a strange attraction to her. Of course it doesn't take long before things start to take a turn for Owen and he realizes that what might be living next door is not at all a little girl. It is clear that Matt Reeves holds the original film in high regard, the film clearly shows respect and understanding of its source. I have posted an interview with Matt previously here, which somewhat explains his motive for making the film. There are a few sequences that are almost identical to both films, but there are just as many that are new. I do believe this is one of the best remakes to come out of Hollywood in years, but I could never recommend it over the original. I don't know I think I need to rewatch it, I just did not like it. I rewatched Let The Right One In a few days before I watched Let Me In and I just did not feel the connection the leads had in the original to the remake.. I really think your issue was more with having just seen Let The Right One In. I can't watch remakes directly after the original, it is unfair to the remake for a start as really you need to try and judge it based its own merits. Which is what I attempted here.